In my last review of this title I had said it was heartbreaking to say the least. Well that statement still holds true throughout this issue and has me wondering: Is Millar going to kill these characters off? 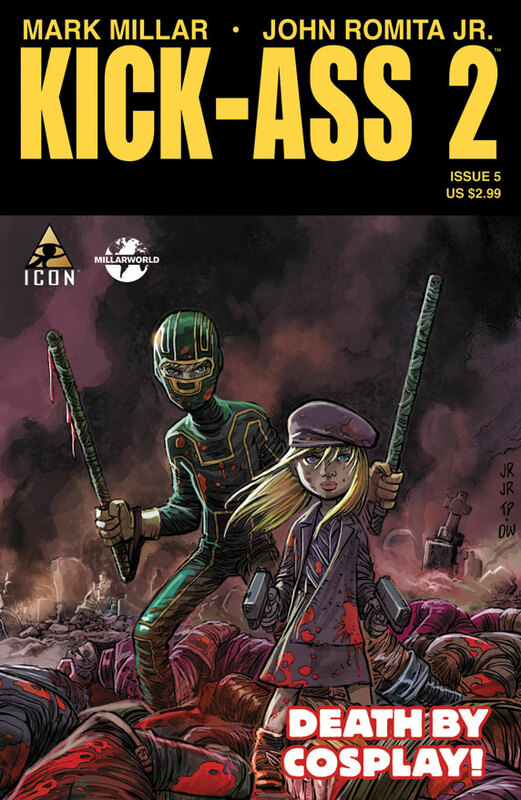 It was said Hit-Girl will have her own book coming out soon, but, what about Dave?! This issue kicks off with Dave visiting his father in jail, a place he is only held for covering up Dave’s secret identity. We also get a nice look at The Mother-F*ckers headquarters and a bit of information about his plan to attack the city. Yet again, this story takes a dramatic turn for the worst within the first 5 pages. It’s a spoiler I can’t give away. It looks like everything that Dave has loved is now gone and as though he may just give up. In the last few pages Mindy becomes aware of what it is she must do, even if it goes against her family wishes. Hit-Girl must return. It’s now or never. I really can’t believe where Millar is taking this title. In a sense I see whats going on but don’t want to mention till my next review of this title. I’m thinking this may not be the end of our good friend Dave but it could be an early retirement. When Chris, Dave, and Mindy put the puzzle together I think they may realize their little game of hero-and-villain was really only fun for the three of them. It has come to a point where they all seem to be fighting now for the exact same reason. The death of a loved one, but, they aren’t seeing the connection. I give this issue a 5/5. Turns out this story is building to something intense and shocking, proving it to be worth any Millar or super-hero fans time alike.